An old team that knows it’s now or never for them in terms of window of opportunity came out like everything was riding on game 6, as the Toronto Raptors were overwhelmed by the fast and aggressive start from the Brooklyn Nets, winning 97-83 thanks to a big night from Deron Williams, giving us yet another game seven in these remarkable playoffs. Williams scored 23 points in 38 minutes, and made it through a scary moment as the Nets thought they had lost their point guard. Shaun Livingston has dropped out of the rotation, and Jason Kidd doesn’t really trust anyone else running his offense, especially since Paul Pierce seems to be a bit overwhelmed with what’s been required of him physically in the series. 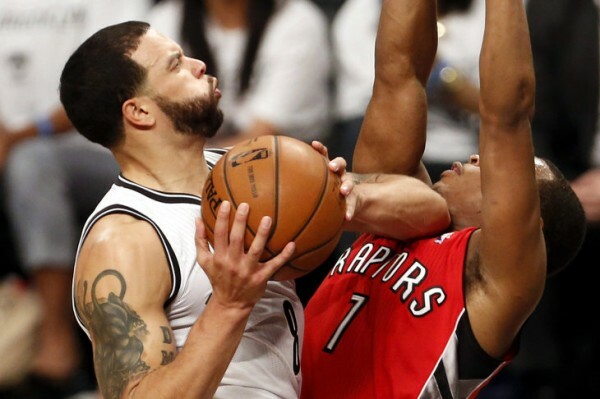 Williams got up and helped the Nets stop a late run from the Raptors. Brooklyn led by 26 points before the Raptors pushed through with a comeback that brought down the lead to single digits. Williams, once again, was the difference: He’s averaging 23 points in the three wins, only 12.7 in the three losses. It’s not exactly news that the Nets rely on him heavily, but considering all the players around him, you’d expect that dependency to be a little less obvious. Now it remains to be seen if the Nets have it in them to pull off more of this effort in consecutive outings, something they’ve struggled to do in the series and overall found it hard this season to put in big performances one after the other. Kevin Garnett scoring 13 points and playing 27 minutes was possibly the most shocking thing to watch in general after looking like a washed up player for most of this series. The Nets scored 48 points in the paint, a postseason high for them in the series and were a lot more aggressive in terms of attacking the basket instead of constantly looking for the jump shots, which the Raptors have dealt with quite well in the previous two games. They also made life difficult for Kyle Lowry, scoring only 11 points on 4-of-16 from the field, and limiting him to only 2 points on drives to the basket, compared to the 8.4 he was averaging before the game when driving to the basket. Five different players took turns in slowing down Lowry, who made the mistake of trying too hard instead of letting the game go to someone else. DeMar DeRozan scored 28 points, but the Raptors didn’t go enough to Jonas Valanciunas (only five field goal attempts) and looked a lot like the team that played bad, selfish and unintelligent basketball through the first three games of the series. Are the Nets favorites? Experience suggests they are, but considering how problematic it has been for them to make it two consecutive solid games in this series and late in the season, it’s probably up to Deron Williams to find some energy from somewhere while the rest of the team keeps up this outstanding defense (slowing the Raptors down to 92 points in 100 possessions), and lead his team towards that series with the Miami Heat they’ve been looking forward to meet.